Semeru Trekking, Mount Bromo tour package 5 days is special volcano trekking tour to explore Sunrise from highest volcano in East Java Island and Sunrise from Mount Bromo peak. If you only interested to make a hiking tour to Semeru volcano, you just spend your time for 3 days and 2 night. 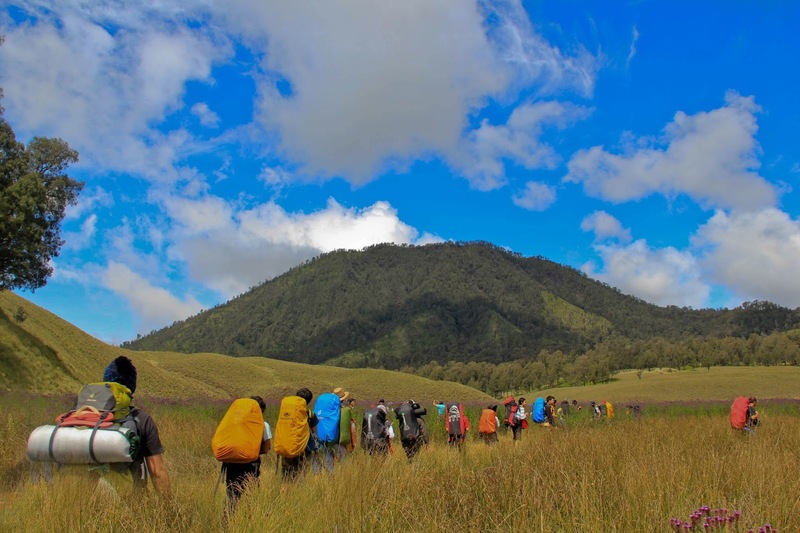 This trekking tour included 1 night Kumbolo Lake Camping and Camping on Kalimati village. Semeru volcano climb and Mount Bromo sunrise tour mostly started from Surabaya, Malang and Banyuwangi Ketapang Harbor. The nearest Way is from Surabaya or Malang If You start your trekking from Mount Semeru Summit. If You think that 5 days 4 night for Semeru volcano hiking package and Mount Bromo sunrise tour feeling too long, you can try the trekking for Semeru Volcano Climbing, Bromo Tour Package 4 Days without stay in the hotel at Tumpang or Ranu Pane area, read detail itinerary below. We will Pick you up from Surabaya, Malang or Banyuwangi then take you to Ranu Pane village for 6 hours. Arrive on Kumbolo by trekking, have lunch, enjoy all Kumbolo Lake views as your please then climbing to Kalimati Camp for 4 hours, Arrive on Kalimati camping, Stay 1 night with the porters service (You will also served your dinner). Wake up at midnight (00.00 AM) then start Mount Semeru hiking package on the rough ground, steep trekking about an hour to Arcapada. Most people reach the Semeru volcano crater about 5 hours, but it depends on your body strong to keep going. the best time is at mid night due the gas produces by continuing smokes of Mt Seme to reach the beauty of Semeru volcano Sunrise and all the views around. After you reacf Semeru volcano summit (Mahameru), It is the time to grant your dream to admire the beauty of Mount Semeru . You will stand on the highest volcano in Java, Indonesia. You have to see the small-scale eruption every 15 minutes full of smokes and stones. So enjoy your achievement until really satisfied, you have deserved it but do not stand into closer space from the crater because the volcano smokes is very dangerous for your breath. Finish enjoy the Sunrise from Semeru volcano summit by trekking, then comeback to Kalimati (camp) to have breakfast and to rest for a long morning trekking. After breakfast we will continue to Kumbolo Lake (Ranu Kumbolo) and stay to enjoy beautiful lake while making a camp to stay one night. In Ranu Kumbolo, you can indulge your time for pretty sunrise after waked up. Wake you up to have breakfast and enjoy the Kumbolo Lake Sunrise from the lake edge until finish and comeback to Ranu Pane (parking lot) using different router via Ayek-ayek village the slope of Semeru summit. We will arrived in Ranu Pane at around 10.00 AM or 11.00 AM, then having lunch before continue your trip. After finish your lunch, continue your trip to your hotel in Bromo mountain, then stay for 1 night. 02.30 AM, Wake you up for preparing, take shower then start visit Pananjakan (the highest peak) for 30 minutes using private jeep 4 WD. Arrive on Pananjakan parking lot, do soft trekking for 20 minutes to view point then waiting Sunrise time 05.20 AM. Enjoy the Sunrise and other views until really finish and satisfied then return to your jeep at 06.30 AM, Continue to the Crater by stop at Sea of Sand (Jeep Parking) for 20 minutes. Finish enjoy the crater, comeback to your Jeep then continue to your hotel for breakfast, take shower and preparing to check out. Check Out from your Hotel and comeback to Surabaya or other city as your request, and finish Semeru volcano climb, Mount Bromo trekking package 5 days. Before start your vacation to Mount Semeru trekking package, Bromo Sunrise tour 5 Days, You can prepare mountain clothes such as jacket, Gloves, Trekking Pole and other personal equipment because on these volcano the temperarture is very cold around 03 - 05 degree cntigrade at night. If You dont have one of the mountain clothes, We provide the rental to equip your necessaries. We only provide the trekking package option by Private in each order because sharing trip always have problem when each visitors have difference plan and timing destination. For detail information about Semeru trekking and Mount Bromo tour package price, You can visit Our contact.